Friday morning and it was another lovely day in DC (lovely to a person who is used to living in a very cloudy city). Today is our last day (of course we can have meetings on own tomorrow) so let us say it is the last official day of our Annual NPI meeting. We don’t know yet where destiny might take us from know but we are very confident the strong bonds built during the last three years will allow us to continue seeing each other and working together for many years. Then we had a great lecture given by Michael Gollin on Freedom to Operate. Key steps for accessing innovation strategically were given. You can always buy it, go around it or fight it… At the end of the day, IP does not have to always be an obstacle! Michael provided a very sophisticated diagram on accessing an outsider’s innovation when access is not readily available. Lots of creative ways there for achieving our goals. Afterwards, very interesting input was provided by Marc since he shared CIP’s experience on FTO on weevil resistant sweetpotato. Thanks Marc! Next, a panel integrated by Silvia, Carolina, Marc, Michael and Victoria shared more experiences on FTO and funding terms and conditions. It was pointed out by Silvia that it is essential to know (and read!!) all agreements related to technology transfer. We can not assume that IP issues are well understood by all actors involved in a project. Therefore, a good practice is to raise all IP issues from the very beginning. Then, Carolina raised the issue that national organizations are susceptible to be refused to get material from companies even though IPRs are not granted in the country. At this point, although there may be FTO, it might just as well not be applicable in reality. Subsequently, Victoria mentioned that there are some specific circumstances or elements (such as immunities) that need to be taken into account to understand the whole context of every project. Michael then mentioned that most of the time it is by making a cost/analysis assessment that the best way of proceeding can be determined. Questions and comments were posed later on regarding “fair use”, use of traditional knowledge and genetic resources for research, disclosure requirement in patenting processes and patent landscapes. After healthy and not so healthy meals, we talked a bit about the NPI Future. As the NPI has evolved into a strong community of practitioners, we are searching for a new host/coordinator. Our own participation as members is required for funding raising and we are determined to do so (you can be sure of this Peter). Although the day started with a whimper it ended with a bang as NPI participants left fully charged with new ideas. The plan for the day was to visit USDA to learn about its plant variety protection procedures through a series of presentations by USDA staff. However, our visit got delayed by a couple of hours because of the lack of transport to reach the USDA campus from the metro station. Luckily after an hour or so, some of us got the bright idea of hiring taxis and it worked. At USDA we got a terrific welcome “à l’Americaine” with plenty of good cheer, warmth and food. Overall the visit was a great learning experience for all NPI participants as the presentations provided a window into the world of USDA plant variety protection program, germplasm system, international partnership, and technology transfer, licensing and patenting. The first presentation was on U.S. Plant Variety Protection Office by Janice M. Strachan, Senior Examinor, Plant Variety Protection Office. She walked us through the entire process of how a plant variety protection certificate is obtained based on the rigorous criteria of: new, uniform, stable and distinct. It was interesting to learn that the number of applications for certificates has gone up from about a 100 to 500 per year, and the main demand relates to corn varieties for biofuel. Peter Bretting, National Program Leader, USDA, Agricultural Research Service (ARS) Office of National Programs spoke on the USDA National Plant Germplasm System, which is one of the largest in the world holding about 534,000 samples of 13,400 plant species. Its Germplasm Resources Information Network (GRIN) has now become a world reference. Eileen Herrera, Deputy Director, USDA, ARS Office of International Research Programs made a presentation on Office of International Research Programs. She emphasized the similarities between CGIAR and the USDA ARS and highlighted the recent ARS-CGIAR Meeting to explore collaboration on how both the organizations can strategically address food security in the changing global agricultural research environment. The ARS Office of Technology Transfer was introduced by Diana Tucker. The main functions of this department are marketing, patenting, and licensing as well as agreements such as MTA and confidentiality. The activities are conducted on the assumptions that IP protection is a necessary incentive for private investment in financially risky innovations and that the private sector delivery of products and services is often the most effective and efficient means of technology transfer. Tuesday 15th June saw the second day of the 2010 Annual Meeting of the National Partners Initiative. The day was dedicated to round table discussions. There was a bitter sweet ending to the day. This summer Victoria Henson-Apollonio will be retiring. In her honour, the NPI group made presentations traditional to their country of origin. Victoria was draped with fabrics and given gifts from the four corners of the globe! Victoria, we are all going to miss your energy and input into CAS-IP and the NPI when you leave! 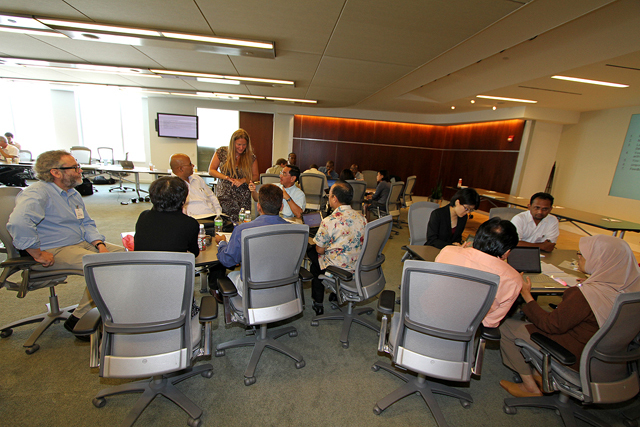 CAS-IP is in DC and we are hosting the 4th annual meeting of the National Partners Initiative (the NPI). PIIPA is co-sponsoring the meeting, and Mark Davis, PIIPA President and Acting CEO welcomed the participants who are joining us from around the world. Victoria Henson-Apollonio, Manager of CAS-IP talked about the future of the NPI as the DGIS funding to CAS-IP that has supported these activities expires at the end of 2010. There are exciting opportunities and we will report on the NPI’s new home when a final decision has been reached. The morning was dedicated to discussing the workplans participants are engaged in throughout the year. Outputs and experiences are shared with the group. The afternoon was dedicated to presentations of the latest case studies from the group, for review and comments from peers. Topics included “Dealing with problems related to the implementation of the plant variety protection act in Thailand”, “Plant variety protection system in China”, “Farming community registry as a farmers’ rights mechanism in the Philippines”, and “Audit of KARI’s plant varieties/plant breeders rights”. Drafts of these case studies will soon be available. I would also like to take this opportunity to welcome all of the participants to the meeting. I’m looking forward to what promises to be a productive and enjoyable week! Our list of participants includes representation from the following organisations: ICRISAT, IRRI, ILRI, CIP, AVRDC, AfricaRice (formerly WARDA), CIAT, Bioversity, CIMMYT, IWMI, Moi University (Eldoret), KARI, NABDA, NCRI, Plant Variety Protection Division (Thailand), NAARM, WSU, ESTUDIO GRAU, Division for Plant Variety Protection (P.R.China), FORDA, MARDI, INERA, PROINNOVA, Copyright Office (Burkina Faso), Plant Variety Protection Office (Phillipines), LESI, PIIPA, AATF and of course CAS-IP. It’s an impossibly long list of acronyms I know… I am hoping someone can help me out with links for all these organisations in the comments section!